Early in the month, I presented my young niece and my new granddaughter with their very first cookbooks. Princess cookbooks, of course! I’m still a little unsettled by the implied main ingredient of the 7 Dwarf Stew, but overall the dishes sounded fun and tasty. Cooking with my great grandmother, grandmother, aunts, sister and mother is probably my very favorite childhood memory. It spawned a passion that has continued into my adulthood and I have made every effort to pass on to my own children, and now my grandchild (which is odd for me to type…I am still getting used to the title though I am certain I will master it eventually. I had amazing role models!). I learned how to read recipes, adapt them, substitute ingredients, and fix mistakes. I learned that a palmful is about a tablespoon and a good pour is about a 1/4 C. I learned that it’s not a good idea to lift the mixer out of the bowl while it’s turned on. The remnants of many dishes graced the underneath of cabinets and the kitchen ceilings for awhile so this lesson took a bit longer to learn apparently. Most importantly, I learned that a good cook tastes as they cook and that eating raw cookie dough probably isn’t going to kill me but it can contribute to quite the belly ache! All of these great life lessons will be passed on for generations to come! During the month, I also downloaded several new e-cookbooks to my tablet: Salads to Go, Yummy Cast Iron Cookbook and The Grilled Cheese Recipe Showdown. And, I cleaned and organized my cookbook collection. Yes, collection. I collect cookbooks like many women collect shoes. I love them, especially if they include beautiful photos of the dishes. 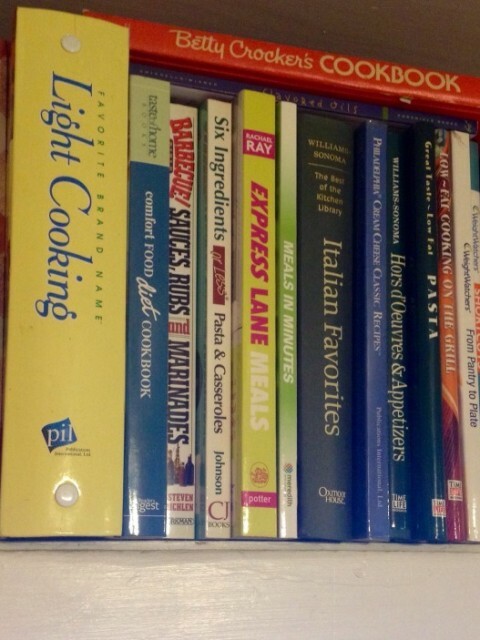 I have hundreds of cookbooks, and I use them. Do I follow the recipes step by step? Rarely. They are more of an inspiration. They are riddled with post-its and have scribbles in the margins adapting recipes and making notes. Even I sometimes have trouble deciding what to fix for dinner, so I head to the cookbooks and flip through until I find something that looks good and I have the primary ingredients for because I can always adapt the recipe, of course. So, I bet you are wondering which book is my favorite!?! The Encyclopedia of Vegetarian Cooking. No, I am not a vegetarian. This particular book is a true encyclopedia of every vegetable in the world. It describes how to store them, clean them and cook them. And, in this cookbook is the very best hollandaise sauce recipe ever. It ruined me for ever eating hollandaise at a restaurant, and is so good that I will lick the inside of the blender to get every last drop. Sometimes, I try to think of a dish I can prepare that includes hollandaise just because I am craving the sauce! 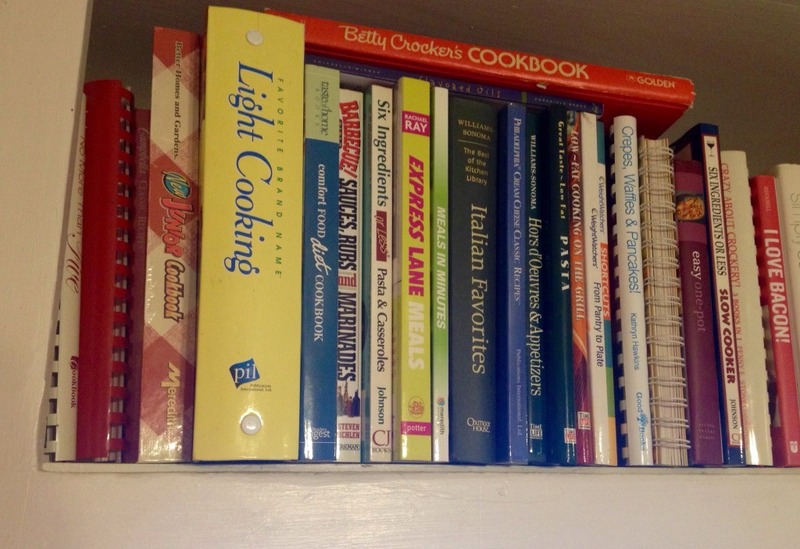 Of all of the cookbooks I have, about 20 are my children’s. And, yes, they use them too! My son, who is now 11, will say, “hey mom, let’s fix something new!” and he will search through to find something he wants to try. Believe me, this is a much better option than when he was younger and wanted to develop his own recipes. He would mix together the strangest of concoctions and I would have to sample them. Putting some of his “special” dishes in my mouth was truly a sign of a mother’s love for her child. I’m happy to announce that none of his recipes actually killed me, though there were several that I disposed of discreetly. 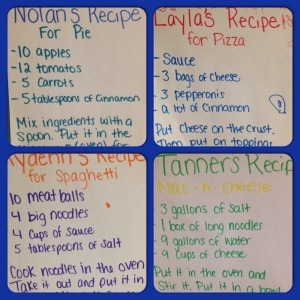 I was recently reminded of his style of cooking when one of the teachers at the child care center I direct had the preschool age children write their own recipes for their favorite foods. I am certain that no one wants to try any of these dishes! Tonight, my son surprised me by fixing dinner himself with me helping as his sous chef. I had very limited duties. His meal of hot dogs with macaroni and cheese and peas doesn’t seem very impressive until you hear that the macaroni and cheese was made from scratch. It was very good (a little stringy, but tasty!). Next cooking lesson for him: béchamel sauce. These days we have amazing technology at our fingertips! We can Google recipes on our phones, find the instructions for absolutely anything on Pinterest, and can have hundreds of cookbooks downloaded that fit in the space a single e-reader occupies. But, it’s not about the recipes. It’s about cooking and the connections it makes. And truly, nothing will ever replace the feeling of an actual cookbook in my hands with the cover sticky from food spilling, the pages wrinkled and creased from use and the spine having to be taped from being opened and closed over and over again.